Gwen Stefani is back and what a way to make an entrance, back into the music industry and charts across the globe by making the first ever music video to be created on live television. It was performed and recorded during The Grammy's, There have been many live music videos done before, and many done during one take. Taylor Swift's "We Are Never Ever Getting Back Together" instantly comes to mind, and this video from Gwen Stefani feels similar. The music video is good none-the-less but doesn't really relate to the song. Gwen Stefani shoots a live music video for her new song, yet was it really worth all the hassle, especially if it doesn't relate to the song? Gwen Stefani is the front woman of band No Doubt, who are back on hiatus. They had a string of hits, but they are mostly known for their song "Don't Speak". Gwen Stefani has had a successful solo career so far, and even reformed with the band a while ago and released singles "Settle Down" and "Looking Hot" for their most recent album Push And Shove. As a solo act, she has done well in the UK, many of her songs have hit the top 10, and "Sweet Escape" came a close number two. She needs a number one single, much like Avril Lavigne does, but whether either of them will get to the top of the UK singles chart, now that's a question we can't possibly know the answer to. This song isn't one of Gwen Stefani's best, and definitely won't get her a UK number one, although it is a little bit catchy. 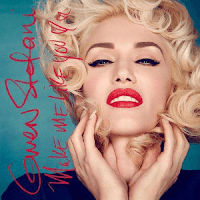 The song was written by Gwen Stefani, Justin Tranter, Julia Michaels, Mattias Larsson and Robin Fredriksson. This music video was shown on live TV on 15th February 2016, and then later appeared on Vevo and YouTube the day after. It was directed by Sophie Muller. I love the start, this is the old quirky Gwen Stefani we all know and love, it's very reminiscent of her early songs and music videos when she was just kick starting her solo music career. The video continues as she walks, runs and dances her way through different sets. It's kind of scary because if anything goes wrong, then that is it, it'll be on live TV for everyone to remember. This is then intensified when she's on roller skates, and just as we think about how embarrassing it would be if she fell over, she does. Luckily it's not actually Gwen Stefani. It's a stunt-double who fake falls. Gwen Stefani did not really fall over, this is a fact. A lot of thought definitely went into this music video, and yet it feels unrealistic, and a little bit on the cheap side, especially when Taylor Swift's music video for "We Are Never Ever Getting Back Together" is something much much clever and actually relates to the song. This feels like they just strewn scenes together, without any thought towards the song. However Gwen Stefani has perfect performance attitude in the whole of this. She is someone who would be good on a stage, that much is undeniable. Formed in 2012, this blog started off as a music video review blog, but has turned into so much more. Created by Jonathan Currinn, promoting himself in any way possible. Currently writing for The Coffee Lounge, Outlet Magazine and CelebMix, he is taking every opportunity as it comes, and is prepared to turn this into his career.